Measurements: Frequency, Period, Ratio, Time interval, Rise/Fall Time, Duty factor, Pulse width, Voltage, Burst freq. 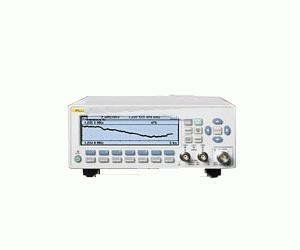 The Fluke PM 6690 timer-counter-analyzer is the most versatile and accurate tool for measuring time, frequency, or phase. On top of that, the PM 6690 has built-in analysis capabilities that give you the dynamics and the statistical behavior of the parameter under test. The PM 6690 offers an intuitive user interface and graphical display which makes it easier to use than any other timer-counter. And all this at a very attractive price!